How to make Free Calls from PC using CrowdCall : Tutorial | Free Pc to Phone Calls, Free Voip Calls to India International ! 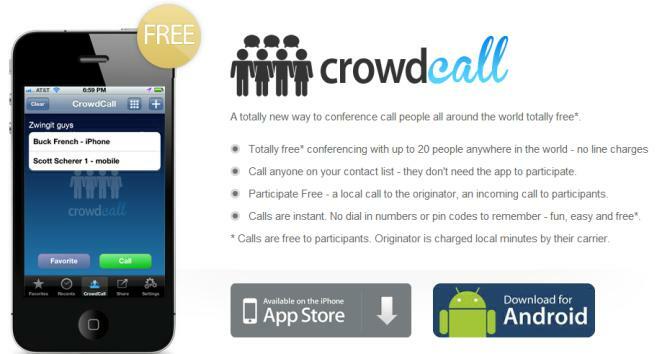 CrowdCall is getting really popular (thanks to its iPhone and Android application). It is already in top charts of Google Play and Apple Store. For those who are new to crowdcall, it is offering free calls each day which is valid for about 40 countries including India. Crowdcall is a very simple application to use and calling method is too easy. Calls are placed from normal mobile (mobile to mobile), it just needs to be initiated from the smartphone application. Hold on! That's no it. We figured out that this can be used from PC as well. You can either initiate the call from crowdcall or you can directly use browser (Pc to Phone Calls). Whatever way you choose, you need not to have any smartphone. For the calls initiated from crowdcall website (tutorial coming below). Crowdcall will call you first on your phone (mobile or landline) and then connect it to your destination. Are you confused ? Just follow the steps below. If you are from free destinations list (40 countries including India), then you can initiate calls from website and use you mobile to talk. Otherwise, make calls from browser : Pc to Phone. Click "Get Started". Or the registration page. Enter your email address and choose a password. Email will be required for verification. Corwdcall will send a verification email. Just verify your mail address. You can two options : Web initiated mobile to mobile calls, PC to Phone Calls. In conference participants, click "Add a participant". Enter you friends number and click add. For India it is like "9198912xxxxx"
Talk as long call remain connected (20 minutes or so). In Call Organizer : select "Call my phone." Click "Change organizer number". Enter you number here. For India it will be like "0119198912xxxxx"
If you have a smartphone (or iPod or iPad), then we would suggest to read our tutorial on it (which include a video tutorial as well). Please check the tutorial and crowdcall features here. PS : You can easily use this service to make free calls to India and other countries. If you face any problem placing phone calls, then please let us know. We will try our best to solve all your issues and help you make free pc to phone calls. Verification email to confirm email account is not working. Verification email sent to my email account is not working.So could not try to make calls..